Stainless Steel range for machining surfaces, pipes, profiles, corners and edges which requires highest standards in precision, surface quality and finish. 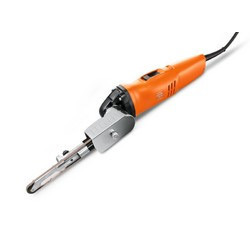 The products range in Stainless Steel includes Compact Angle Grinder for Stainless Steel Application, Polishers, Straight Grinders, Pipe Polishers and Belt Grinder to suit the toughest Stainless Steel Application. 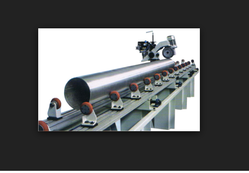 We are the leading and prominent manufacturers and suppliers of the Metal Pipe Polishing Machine. Stainless steel is corrosion-resistant and hard-wearing, and literally ’shines’ with design possibilities. But until now only users with decades of hands-on experience had the necessary practical expertise to carry out professional, effective work with stainless steel. As an experienced partner to the metal industry, FEIN has an in-depth understanding of the requirements of stainless steel machining and offers a range of optimum solutions in this area. These solutions include durable, robust FEIN products and also special accessories and accessory sets that are specifically tailored to stainless steel applications. Whether you need to give a mirror finish to large surfaces, or machine pipes or profiles in hard-to-reach places, such as handrails, FEIN can help you achieve optimum results in a fraction of the time. High-quality polishing results for surfaces, pipes, and profiles. Larger tool diameters are available for larger immersion depths. RS 12-70 E - Professional Stainless Steel Set. Stainless steel is corrosion-resistant and hard-wearing, and literally ’shines’ with design possibilities. But until now only users with decades of hands-on experience had the necessary practical expertise to carry out professional, effective work with stainless steel. As an experienced partner to the metal industry, FEIN has an in-depth understanding of the requirements of stainless steel machining and offers a range of optimum solutions in this area. These solutions include durable, robust FEIN products and also special accessories and accessory sets that are specifically tailored to stainless steel applications. Whether you need to give a mirror finish to large surfaces, or machine pipes or profiles in hard-to-reach places, such as hand rails, FEIN can help you achieve optimum results in a fraction of the time. The optimum machining of stainless steel pipes and profiles involves a wide range of different challenges. When used in hand rails, for example, they often serve as design element as well as functional element. In cases like these, optimum surface quality is of prime importance. 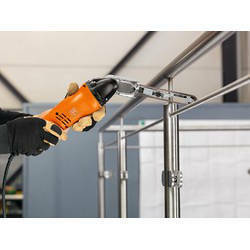 FEIN power tools and stainless steel sets enable you to machine even hard-to-reach places without any need for dismantling – and in a fraction of the time. Small but highly versatile: with its extremely compact design the AHSI 636 c is the ideal straight grinder for all corners and edges, for example on hand rails. When you have to work in narrow spaces the small width across the corners is simply unbeatable. It’s versatile, robust and offers good speed stability. The drill chuck allows you to clamp any kind of tool. 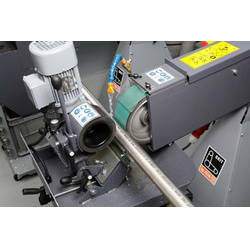 The pipe sander for all standard uprights and hand rails. Ideal for machining pipes and pipe bends. From cleaning off dirt, removing tarnishing, sanding fine welded seams and satin-finishing to polishing preparations and polishing to a mirror finish. The sander is small and easy to use. It’s fitted with a drive head which can swivel almost 360° to enable comfortable use, even in tight spaces. 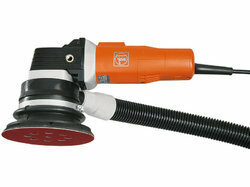 The sander is very flexible and can be variably adapted to different pipe diameters or sanding belts. Stainless steel is corrosion-resistant and hard wearing, and literally ’shines’ with design possibilities. But until now only users with decades of hands-on experience had the necessary practical expertise to carry out professional, effective work with stainless steel. As an experienced partner to the metal industry, FEIN has an in-depth understanding of the requirements of stainless steel machining and offers a range of optimum solutions in this area. These solutions include durable, robust FEIN products and also special accessories and accessory sets that are specifically tailored to stainless steel applications. Whether you need to give a mirror finish to large surfaces, or machine pipes or profiles in hard-to-reach places, such as hand rails, FEIN can help you achieve optimum results in a fraction of the time. 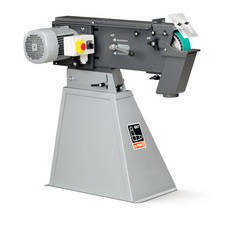 Stationary GRIT belt grinders are powerful, robust and modular. With a combination of special grinding belts, they create individual grinding patterns. As another benefit, because pipes and profiles are often ground as part of automatic production processes, GRIT machines are also optimised for volume production. As the inventor of the electric handheld drill, FEIN has been developing innovative and unbeatably efficient solutions for practical applications for 140 years. Independent addition to the GX program for the deburring of steel and stainless steel Work pieces with wire brushes also available with machine base. Deburring, grinding, cylindrical and radii grinding: to cover the entire spectrum of working with steel or stainless steel you need a broad range of machinery – or the GRIT GX programmed. Because it always provides you with as much machine as you currently require – if your requirements change, so does your machine. The GRIT GX programmed is modularly designed. 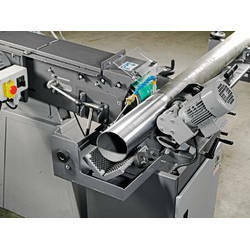 By attaching the appropriate modules you can quickly transform a basic belt grinder into a cylindrical or radii grinding machine. That saves long changeover times, a lot of space, and the investment into a complete machine outfit. An ideal addition to the GRIT GX programmed: The deburring machine GXE completes the final task. 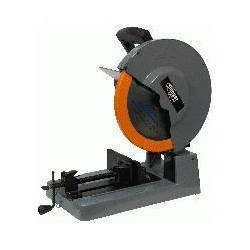 It is highly effective for deburring pipes, profiles and flat materials. 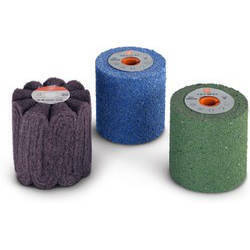 The broad spectrum of GRIT deburring brushes solves nearly all deburring jobs. Workpieces made of steel, non-ferrous metals and stainless steel can be quickly and effectively deburred by the deburring machine GIE. The robust construction and the powerful drive make this machine ideal for industrial applications. As a table-top device or with the optional base it can adapt itself even to confined conditions. The optimum machining of stainless steel pipes and profiles involves a wide range of different challenges. When used in hand rails, for example, they often serve as design element as well as functional element. In cases like these, optimum surface quality is of prime importance. 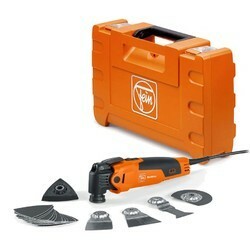 FEIN power tools and stainless steel sets enable you to machine even hard-to-reach places without any need for dismantling – and in a fraction of the time.Small but highly versatile: with its extremely compact design the AHSI 636 c is the ideal straight grinder for all corners and edges, for example on hand rails. When you have to work in narrow spaces the small width across the corners is simply unbeatable. It’s versatile, robust and offers good speed stability. 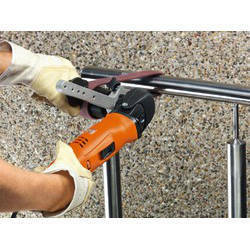 The drill chuck allows you to clamp any kind of tool.The pipe sander for all standard uprights and hand rails. Ideal for machining pipes and pipe bends. From cleaning off dirt, removing tarnishing, sanding fine welded seams and satin-finishing to polishing preparations and polishing to a mirror finish. The sander is small and easy to use. It’s fitted with a drive head which can swivel almost 360° to enable comfortable use, even in tight spaces. 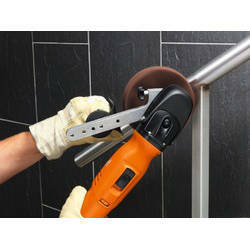 The sander is very flexible and can be variably adapted to different pipe diameters or sanding belts. Large or small, smooth or textured, glossy or matt – the machining solution you choose depends on what your surface looks like now and how you want it to look when you’ve finished the job. 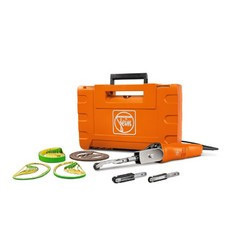 FEIN is the first manufacturer to offer the necessary expertise, the tools, the right accessories and specially matched stainless steel sets for surface machining. Stainless steel is corrosion-resistant and hard wearing, and literally ’shines’ with design possibilities. But until now only users with decades of hands-on experience had the necessary practical expertise to carry out professional, effective work with stainless steel. As an experienced partner to the metal industry, FEIN has an in-depth understanding of the requirements of stainless steel machining and offers a range of optimum solutions in this area. These solutions include durable, robust FEIN products and also special accessories and accessory sets that are specifically tailored to stainless steel applications. Whether you need to give a mirror finish to large surfaces, or machine pipes or profiles in hard-to-reach places, suchas hand rails, FEIN can help you achieve optimum results in a fraction of the time. Stainless steel is corrosion-resistant and hard-wearing, and literally ’shines’ with design possibilities. But until now only users with decades of hands-on experience had the necessary practical expertise to carry out professional, effective work with stainless steel. As an experienced partner to the metal industry, FEIN has an in-depth understanding of the requirements of stainless steel machining and offers a range of optimum solutions in this area. These solutions include durable, robust FEIN products and also special accessories and accessory sets that are specifically tailored to stainless steel applications. 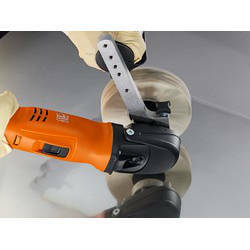 Whether you need to give a mirror finish to large surfaces, or machine pipes or profiles in hard-to-reach places, such as hand rails, FEIN can help you achieve optimum results in a fraction of the time.As a powerful compact angle grinder with variable speed for machining stainless steel, the WSG 14-70 E offers an optimized speed range for stainless steel surfaces and high cutting performance, particularly for precise material removal. The speed is infinitely variable and the tool’s HIGH POWER MOTOR supplies it with very high torque. As a powerful compact angle grinder with variable speed for machining stainless steel, the WSG 14-70 E offers an optimized speed range for stainless steel surfaces and high cutting performance, particularly for precise material removal. The speed is infinitely variable and the tool’s HIGH POWER MOTOR supplies it with very high torque. The RS 12-70 E can be easily maneuvered around tight curves and enables you to rework ready-fitted hand rails. 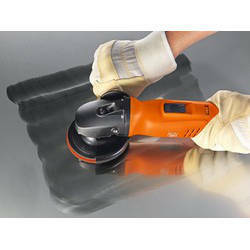 With infinitely variable speed it’s ideal for sanding, satin-finishing and high-gloss polishing. It’s flexible sanding belts adapt optimally to even the tightest pipe bends. As the inventor of the electric handheld drill, FEIN has been developing innovative and unbeatably efficient solutions for practical applications for 140 years. FEIN provides extension module for the “Rounded materials grinding and polishing” application – from rough grinding to mirror polish. 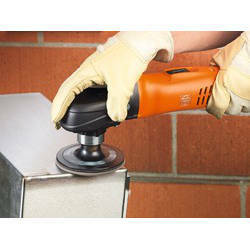 The GXC centreless grinding module allows for perfect surfaces in the simplest manner. The conversion to a “Centreless” cylindrical grinding machine is done in just a few steps. Efficiency and flexibility are apparent in the design and construction. Perfect surface quality and high process speeds on pipes and shafts are no contradiction for the GXC centreless grinding module. Even commercially available fleece belts can be used in connection with the GX 75 2H basic unit. The advance speed can be infinitely variably adjusted for the material; up to 2 meters per minute. Various guide rails are included in the scope of delivery that is tuned to the surface quality of the work piece. The guide rail made of brass is made for rough surfaces such as corrosion, scale, etc., or for dry grinding. 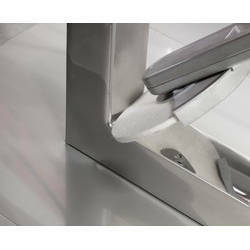 The nylon rail is the perfect choice for surface polishing and sensitive material. There are several arguments for wet grinding using the GXW cooling lubricant module: The swarf is bonded immediately, cooling extends the service life of the grinding belts, the finishing results are noticeably improved and thanks to the reduced heat development during grinding the corrosion risk for stainless steel pipes is reduced. A closed circuit ensures sparing consumption of the coolant. 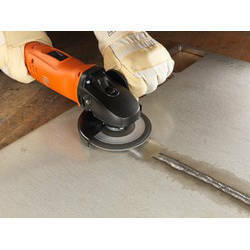 Cleaning, removing tarnishing and deburring: FEIN power tools such as fillet weld grinders offer unique robustness and take up little space. With these tools in your toolkit, even grinding transitions in hard-to-reach places is an easy job. Fast and efficient cleaning and finishing for large surfaces. The corrugated fleece adapts optimally to embossed surfaces. 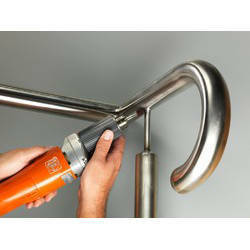 Clean pipes and profiles quickly and efficiently. The corrugated fleece adapts optimally to any given structure. 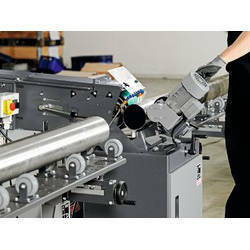 The pipe sander for all standard uprights and hand rails. Ideal for machining pipes and pipe bends. From cleaning off dirt, removing tarnishing, sanding fine welded seams and satin-finishing to polishing preparations and polishing to a mirror finish. The sander is small and easy to use. It’s fitted with a drive head which can swivel almost360° to enable comfortable use, even in tight spaces. 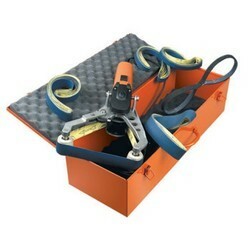 The sander is very flexible and can be variably adapted to different pipe diametersor sanding belts.When optimum grinding of welded seams without damaging adjacent surfaces or perfect satin-finishing and polishing for pipe bends the tools have to bepartnered perfectly for the surface. With FEIN belt grinders you can grind transitional areas that used to require manual machining in a single process, without dismantling. The MShy 648-1 Z is a maneuverable and powerful straight grinder that’s ideal for use in places with difficult accessibility. Its narrow neck is perfect for hard-to-reach places. It offers good speed stability and is perfectly designed for machining stainless steel, for example satin finishing and polishing corners and edges. The spindle with multiple bearings makes for quiet operation and therefore accurate working.Small but highly versatile: with its extremely compact design the AHSI 636 c is the ideal straight grinder for all corners and edges, for example on hand rails. When you have to work in narrow spaces the small width across the corners is simply unbeatable. It’s versatile, robust and offers good speed stability. The drill chuck allows you to clamp any kind of tool.Whether you’re smoothing edges, deburring sheet metal or sanding welded seams, professional surface finishing needs to be flexible yet economic. You need tools which deliver perfect results even in tight spaces or on workpieces which are already in place. 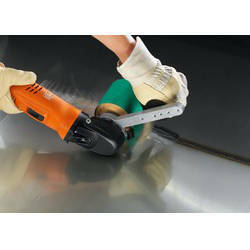 The new powerful FEIN BF 10-280 E makes light work of the numerous demands made of it. It is impressively easy to use, delivers incredible power and enjoys a long life. Professional sanding and polishing of corners and edges is one of the most demanding tasks when machining stainless steel surfaces. This is because they are often difficult to access, which requires the machines and tools used to be extremely manageable and maneuverable. Efficient machining, from sanding to mirror polish,with the fillet weld sander.With the FEIN fillet weld sander, FEIN completes its range of tools for machining stainless steel surfaces. 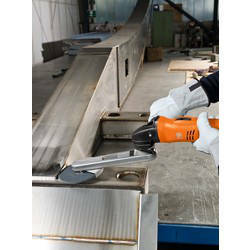 The small, flat and ergonomic tool precisely and quickly machines fillet welds following metallic assembly. You can use it to level, sand and polish as well as remove scratches and unevenness with precision, right into the smallest angles and corners. The speed can always be perfectly adapted to any application and the genuine FEIN accessories deliver perfect results without the need for rework. Machine fillet welds: from sanding the welded seams to polishing to a mirror finish with the fillet weld sander KS 10-38 E.
Flexible use thanks to drive head that can be swiveled without the need for tools. Large or small, smooth or textured, glossy or matt – the machining solution you choose depends on what your surface looks like now and how you want it to look when you’ve finished the job. FEIN is the first manufacturer to offer the necessary expertise, the tools, the right accessories and specially matched stainless steel sets for surface machining.Stainless steel is corrosion-resistant and hard-wearing, and literally ’shines’ with design possibilities. But until now only users with decades of hands-on experience had the necessary practical expertise to carry out professional, effective work with stainless steel. As an experienced partner to the metal industry, FEIN has an in-depth understanding of the requirements of stainless steel machining and offers a range of optimum solutions in this area. These solutions include durable, robust FEIN products and also special accessories and accessory sets that are specifically tailored to stainless steel applications. Whether you need to give a mirror finish to large surfaces, or machine pipes or profiles in hard-to-reach places, such as hand rails, FEIN can help you achieve optimum results in a fraction of the time. The optimum machining of stainless steel pipes and profiles involves a wide range of different challenges. When used in hand rails, for example, they often serve as design element as well as functional element. In cases like these, optimum surface quality is of prime importance. 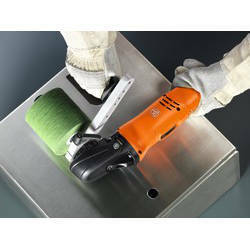 FEIN power tools and stainless steel sets enable you to machine even hard-to-reach places without any need for dismantling – and in a fraction of the time.Small but highly versatile: with its extremely compact design the AHSI 636 c is the ideal straight grinder for all corners and edges, for example on hand rails. When you have to work in narrow spaces the small width across the corners is simply unbeatable. It’s versatile, robust and offers good speed stability. The drill chuck allows you to clamp any kind of tool. Achieve the perfect mirror finish, even with larger pipe diameters of up to 120 mm. 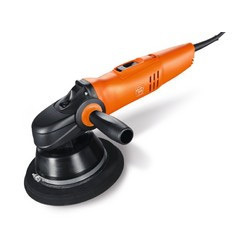 Grind surfaces with sanding sleeves for excellent material removal.With the FEIN fillet weld sander, FEIN completes its range of tools for machining stainless steel surfaces. The small, flat and ergonomic tool precisely and quickly machines fillet welds following metallic assembly. You can use it to level, sand and polish as well as remove scratches and unevenness with precision, right into the smallest angles and corners. The speed can always be perfectly adapted to any application and the genuine FEIN accessories deliver perfect results without the need for rework.Stainless steel is corrosion-resistant and hard-wearing, and literally ’shines’ with design possibilities. But until now only users with decades of hands-on experience had the necessary practical expertise to carry out professional, effective work with stainless steel. As an experienced partner to the metal industry, FEIN has an in-depth understanding of the requirements of stainless steel machining and offers a range of optimum solutions in this area. These solutions include durable, robust FEIN products and also special accessories and accessory sets that are specifically tailored to stainless steel applications. Whether you need to give a mirror finish to large surfaces, or machine pipes or profiles in hard-to-reach places, such as hand rails, FEIN can help you achieve optimum results in a fraction of the time. GRIT deburring machines with stainless steel brushes for efficient deburring of manageably sized workpieces. Precision grinding in seconds with GRIT radius grinding modules. 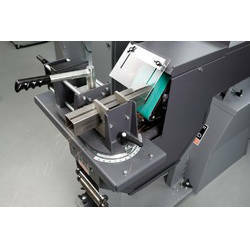 Accurate grinding of mitre joints with mitre joint grinding plate and GIR. Virtually vibration-free preparation of welded seams, maximum material removal and low tool costs: with the GRIT grinding belt quality “R”. GRIT gives profiles a perfect satin finish. pattern to prepare for polishing pipes. for efficient deburring of manageably sized workpieces. GRIT grinding belt quality “R”. Scratches are removed in an automated process. Whether you’re smoothing edges, deburring sheet metal or sanding welded seams, professional surface finishing needs to be flexible yet economic. You need tools which deliver perfect results even in tight spaces or on workpieces which are already in place. 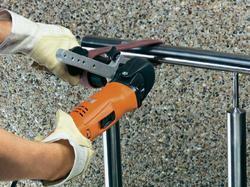 The new powerful FEIN BF 10-280 E makes light work of the numerous demands made of it. It is impressively easy to use, delivers incredible power and enjoys a long life. As the inventor of the electric handheld drill, FEIN has been developing innovative and unbeatably efficient solutions for practical applications for 140 years. 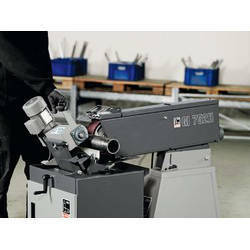 Stationary GRIT belt grinders are powerful, robust and modular. With a combination of special grinding belts, they create individual grinding patterns. As another benefit, because pipes and profiles are often ground as part of automatic production processes, GRIT machines are also optimised for volume production. Flexible use thanks to drive head that can be swivel led without the need for tools. WPO 14-25 E: effectively remove tarnishing. Flexible corrugated fleece adapts optimally to the shape of the material. Tarnishing can be quickly removed without damaging neighbouring componentsby using the (fine) fleece disc. GRIT deburring machines with stainless steel brushes for efficient deburring of manageably sized workpieces. Whether you’re smoothing edges, deburring sheet metal or sanding welded seams, professional surface finishing needs to be flexible yet economic. You need tools which deliver perfect results even in tight spaces or on workpieces which are already in place. 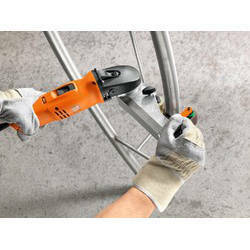 The new powerful FEIN BF 10-280 E makes light work of the numerous demands made of it. It is impressively easy to use, delivers incredible power and enjoys a long life. 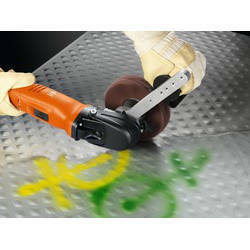 Optimum preparation for polishing surfaces. The right sanding pattern with rotating procedures. 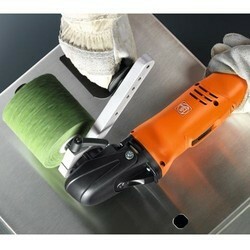 With robust solutions from FEIN, it’s simple and easy to get involved with stainless steel. Sanding down welded seams, cutting out profiles, or polishing and satin-finishing surfaces to a mirror polish – our durable and practical solutions take account of the particular characteristics of the material (such as heat build-up during surface machining of stainless steel plates), giving you the keys to one of the most exciting markets of the future. With high torque lower-speed grinding, using serrateddiscs avoids high heat build-up on the material.Effectively remove tarnishing with the corrugated fleece or fleece disc. For optimum adaptation to welded seams. 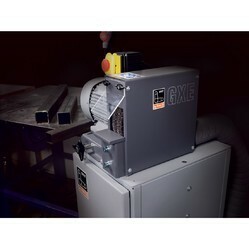 Machine fillet welds: from sanding the welded seams topolishing to a mirror finish with the fillet weld sander KS 10-38 E.